Tomorrow at 3:30 am GMT the RBA will release its monetary policy decision. Here’s how you can prepare for the big event! Early this month the RBA decided to keep its rates steady at 2.50% while saying that the Aussie is still “high by historical standards.” In addition, the RBA said that Australia’s unemployment rate hasn’t peaked yet. Fortunately for the bulls, the Aussie still ended the day higher against its counterparts. Apparently, investors had focused on the lack more dovish remarks and hints that the RBA is done with its rate cut cycle…for now. This time investors are expecting good things from the central bank. Just last week Glenn Stevens boosted the Aussie by not remarking on the Aussie’s strength and relaying his optimism for the economy. Since the RBA isn’t expected to cut rates anytime soon, let’s focus on last month’s reaction when the RBA didn’t make any policy changes. Common Aussie pairs like AUD/USD and AUD/JPY initially fell by around 50 pips in the first 15 minutes of the release before London session traders completely reversed the initial move. The Aussie had stronger initial reaction against its European counterparts. 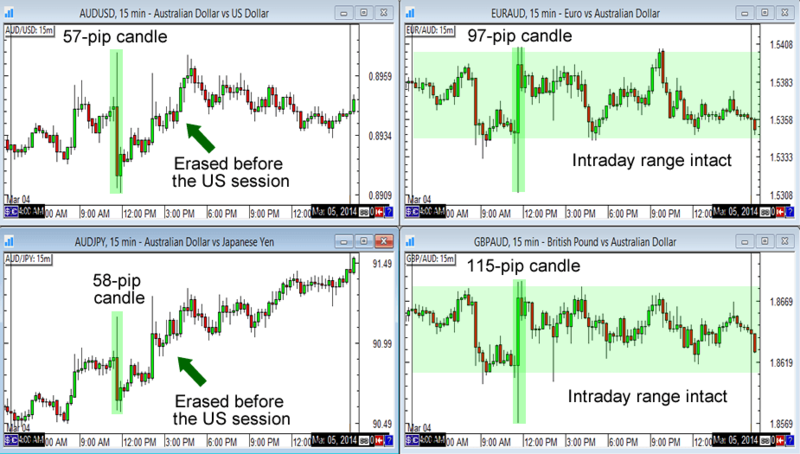 EUR/AUD and GBP/AUD both registered 100-pip candles in the first 15 minutes of the release. Unlike in AUD/USD and AUD/JPY though, the pairs didn’t really go anywhere else for the rest of the day as their intraday ranges remained intact. Whether you’re news trading or you already have positions open, make sure that you make allowances for a volatile day for the Aussie. The Aussie pairs might not end the day significantly higher or lower than its open price but the pairs’ initial reactions could take out your tight stops. In the charts above the Aussie’s initial moves were almost completely reversed by the London trading session. In AUD/JPY’s case, the pair’s intraday trend extended until the U.S. session. Last month only the U.K. construction PMI report was released after the RBA statement. Tomorrow the U.K. manufacturing PMI will be printed at 8:30 am GMT while the U.S. ISM manufacturing PMI will be released at 2:00 pm GMT. These reports could shape risk appetite so make sure you have adjusted your positions before they are released! There you have it, folks! Keep in mind that this is just a trading guide and should only be used as a complement to your own research. Good luck and good trading!